“One year ago this place was not the place you see now. We invested US$100 million in tourism infrastructure. 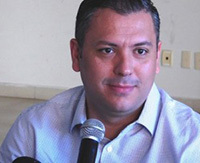 There was a Mazatlan before Tianguis and there is a much better Mazatlan because of Tianguis,” said Juan Antonio Garcia. The results are already clear, both visually and in arrival numbers. The state received 235,000 international visitors in 2016, a number that soared to 500,000 in 2017. The attention created by Tianguis is expected to spur more development and more airlift. Representatives of more than 700 companies from over 50 nations are on hand for the annual meeting of travel buyers and Mexican tourism representatives. In a country that attracts more than 30 million international visitors each year, it’s a very important event. That fact was underscored by the attendance of Mexican president Enrique Peña Nieto at an opening gala held on Mazatlan’s atmospheric malecon. A carnival parade and massive fireworks display were highlights of the evening, as up to 2,000 attendees enjoyed a multi-course meal al fresco. Open Jaw is staying at thelocal Hotel, a brand-new high-rise beachfront property with very attractive modern rooms. It’s not all-inclusive, and that’s no bad thing, as there are dozens of restaurants within walking distance.